This page lists a variety of environmental education resources that have been developed by UCCE Marin. Read the description of each project and follow the links to the final products. "Can My Tree Catch the Flu?" - This series of activities was originally developed for in-classroom presentation but was adapted to work as an exhibit at larger science events, and also translated into a stand-alone, interactive game for the web. Read the full background and access the educational resources for in-person delivery, or see the online game. Also check out our write-up in Green Teacher magazine! This program was developed in collaboration with 4-H Youth Development and the California Oak Mortality Task Force. Other SOD educational resources - The "Trees in Trouble" program uses a Project Learning Tree model to explain the effects of sudden oak death; it is meant to aid teachers in planning and delivering activities. The Junior Ranger guide is a set of games and activities for youth to do on their own; it is meant to be printed and folded into a booklet and is suitable for ages 6+. Additional activities include online jigsaw puzzles of SOD-related images. These activities were developed in conjunction with the California Oak Mortality Task Force. Firewood Pest Passports - This activity was developed for large science events and was run at the Bay Area Science Festival, Marin County Farm Day, and the San Diego Insect Fair, among others. It was later adapted into an online game. Participants learn that moving firewood while they're camping can introduce and spread forest pests. Read the full activity description or play the online game. These activities were developed in collaboration with the California Firewood Task Force and the national Don't Move Firewood campaign. Trees for you and me! - In an effort to share information on the benefits of urban forests, we developed a series of youth activities named "Trees for you and me!" 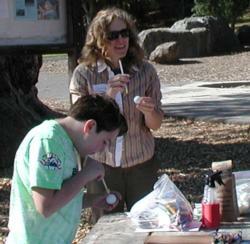 The activity debuted at the 2012 Bay Area Science Festival, and was followed by smaller sessions with 4-H groups and in classrooms. This program is a collaboration with 4-H Youth Development, the USDA-Forest Service Pacific Southwest Research Station, and the California Forest Pest Council. Environmental Stewardship - This project was a 2-year collaboration between UCCE Marin and Conservation Corps North Bay (CCNB). Its goal was to work with AmeriCorps members to build their leadership skills, enhance their knowledge of youth development principles, and provide information on local natural resource issues so they could deliver effective outreach to the community and at-risk youth. Read the full description of the program. Forestry Public Meeting - Older students (grades 5 and up) are invited to participate in a "Town Hall"-style activity to discuss the priorities and actions of forest managers. In collaboration with Rocketship schools in San Jose and the Tuolumne Trails camp in Groveland, students at a week-long outdoor camp take on the roles of interest groups and debate policy actions such as fire supression and controlling invasive species. This project was funded by the Farm Bill and USDA APHIS is a collaboration with the USDA-Forest Service Pacific Southwest Research Station. Field Journals - Using a field journal inside and outside the classroom bridges the worlds of science, art, and literature. We assembled a simple packet to explain the process to teachers and their students. We also focused on drawing leaves in nature journals at the 2015 Bay Area Science Festival. This project was funded by the Farm Bill and USDA APHIS is a collaboration with the USDA-Forest Service Pacific Southwest Research Station. Have you used any of these educational resources? Will you use any of these educational resources in the future? If you do not plan to use these resources, why not? What modifications might we make to better fit your needs? If you have already used these resources, or plan to in the future, what modifications have you made/will you make to better fit the activities to your needs? If we may follow up with you on your responses, please provide your email address.